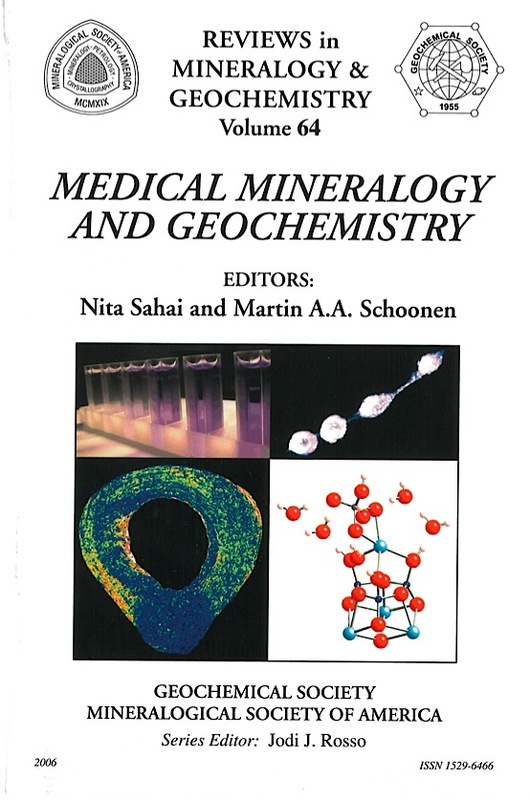 Medical Mineralogy and Geochemistry is an emergent, highly interdisciplinary field of study. The disciplines of mineralogy and geochemistry are integral components of cross-disciplinary investigations that aim to understand the interactions between geomaterials and humans as well as the normal and pathological formation of inorganic solid precipitates in vivo. Research strategies and methods include but are not limited to: stability and solubility studies of earth materials and biomaterials in biofluids or their proxies (i.e., equilibrium thermodynamic studies), kinetic studies of pertinent reactions under conditions relevant to the human body, molecular modeling studies, and geospatial and statistical studies aimed at evaluating environmental factors as causes for activating certain chronic diseases in genetically predisposed individuals or populations. Despite its importance, the area of Medical Mineralogy and Geochemistry has received limited attention by scientists, administrators, and the public. 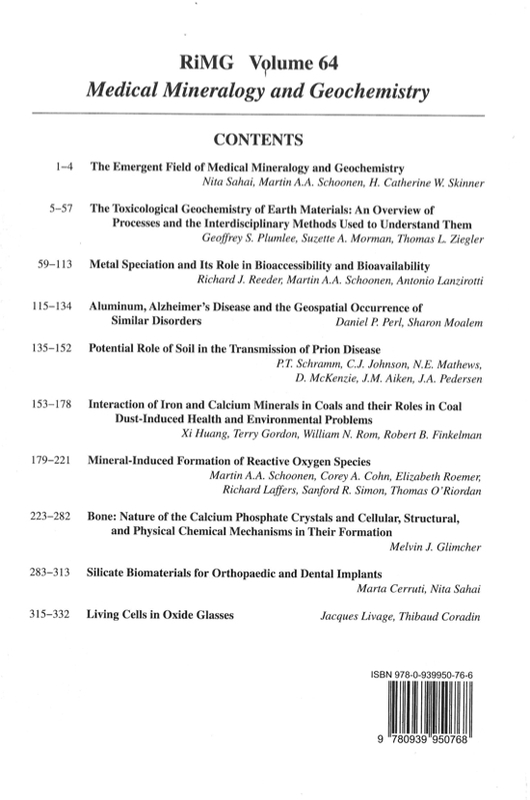 The objectives of this volume are to highlight some of the existing research opportunities and challenges, and to invigorate exchange of ideas between mineralogists and geochemists working on medical problems and medical scientists working on problems involving geomaterials and biominerals. Examples presented in this volume (Table of contents below) include the effects of inhaled dust particles in the lung (Huang et al. 2006; Schoonen et al. 2006), biomineralization of bones and teeth (Glimcher et al. 2006), the formation of kidney-stones, the calcification of arteries, the speciation exposure pathways and pathological effects of heavy metal contaminants (Reeder et al. 2006; Plumlee et al. 2006), the transport and fate of prions and pathological viruses in the environment (Schramm et al. 2006), the possible environmental-genetic link in the occurrence of neurodegenerative diseases (Perl and Moalem 2006), the design of biocompatible, bioactive ceramics for use as orthopaedic and dental implants and related tissue engineering applications (Cerruti and Sahai 2006) and the use of oxide-encapsulated living cells for the development of biosensors (Livage and Coradin 2006).